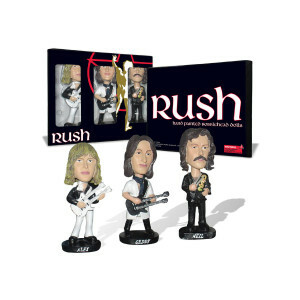 The beloved Rush Bobbles! 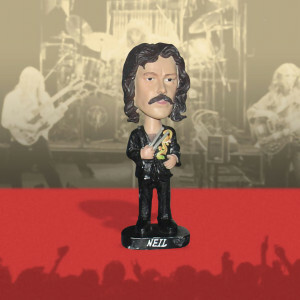 At first when presenting this product concept to the band in 2002, Neil was not sure. 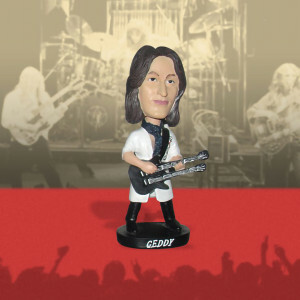 Geddy urged us on, and we produced samples, and once Neil saw them in front of him (while eating dinner backstage on the VT tour), he started laughing hysterically as Alex started moving their heads and speaking in a crazy voice for each doll. The concept was approved! These dolls are polyresin ceramic, which is the highest quality bobblehead on the market. Measuring 7" high (approx. 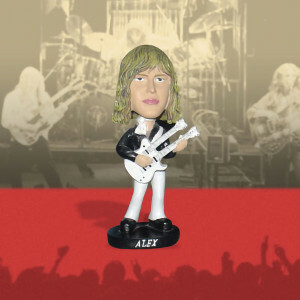 18cm), these dolls have heads that bobble back and forth, kinda like seeing the guys on stage! Each set consists of three dolls (Geddy, Alex, and Neil) in a custom printed RUSH box. These were designed with a "vintage" Rush in mind, from the time when the band wore kimonos, played double neck guitars, and Neil had the most amazing moustache in rock music. These bobbleheads are guaranteed to bring a smile to your face.